India appears to be slowly and steadily diversifying itself from being a hub of software services to a centre for software product development as well, if the buzz at the pre-event session of NASSCOM Product Conclave in Bangalore is to be taken at face value. PAAWA SOFTWARE: Incorporated in 2007 by Prakash Baskaran, Paawa is a Bangalore-based data security solutions provider. Pawaa's information security paradigm is based on building information security ground-up by embedding security intelligence into the very information unit, be it file (any format or content), web (web content), or screens (of applications). The company focuses to prevent enterprise data leaks at the hands of trusted users and provide control over the information for life time. Pawaa has created the first ever FILE format called pawaaFILE meant only for information security that posseses the intelligence to execute information security capabilities at the level of a file agnostic to the content, format, operating environment and underlying transaction and application technologies. QUICKO LABS: The Bangalore-based start up that opened for business in 2010, provides SaaS based SEO platform to help businesses, marketers and startup's seeking to improve online visibility. QuickoLabs SearchEnabler is first on-demand search engine optimization platform launched from India, making organic search marketing easy, affordable and measurable for start-ups, small businesses and individuals seeking to improve online visibility. The company is founded by a group of former Huawei Telecom executives. PERSISTENT SYSTEM: BSE-listed software product development services company Persistent System has launched eMee, a next-generation employee engagement platform, specifically developed for SME and large enterprises with a distributed workforce. eMee, designed and developed using innovative gaming and social networking concepts, helps redefine employee engagement, by offering an intuitive and user friendly platform for interacting with colleagues and peers throughout the organization. eMee encourages social networking in the workplace and harnesses the power of collaboration boosting morale, team spirit and camaraderie. IMAGINATE: Hyderabad-based start-up Imaginate is developing innovative Augmented Reality(AR) based products for retail, advertising, entertainment and medical categories. The company has expertise in AR and virtual reality and will soon start providing custom services in experimental solutions and virtual demos. The company is founded by Hemanth Satyanrayana and Pavan Kosaraju, both IIT alumni, with more than two decades of experience in the techniology and management consulting industry. SRIJAN TECHNOLOGIES PVT LTD: Haryana-based Srijan is a technology consulting company specializing in enterprise open source CMS Solutions, primarily using Drupal. Drupal is open source software maintained and developed by a community of 630,000+ users and developers. The company specializes in building web portals, specifically for the online media publishing vertical. The company has developed several large portals such as MNN.com and Open Magazine. Srijan hosted service for businesses to seek anonymous and crisp responses to questions. The company is developing this product keeping in mind few aspects, such as no simple mechanism for companies to seek anonymous feedback for itself or for its leadership, public surveys do not reflect people's attitudes. CONWERGE WEB SERVICES PVT LTD: The Bangalore-based company has developed a product called Grupur.com, which provides a powerful combination web workspace and web workflow for groups to accomplish different group goals. Grupur implemented a unique transaction template mechanism which helps in defining web platform for doing transactional grouping. Transactional grouping means a group of people come together to accomplish a common goal in a time bound manner. The company is started by professionals with nearly three decades of combined experience with leading companies including Sybase, Informix, IBM and Swisscom. SEMGEL TECHNOLOGIES: Semgel is a web technology startup based out of Bangalore and London. The company focuses on helping build a web of data and developing applications that harness that web of data. Semgel is targeted at knowledge workers who need to gather, organize and analyze data found on websites. Spreadsheets have been the primary tool for downloading and analyzing data from websites. The company seeks to simplify this process and make this capability accessible to the average spread sheet user. With Semgel, users can gather data quickly by searching from within the application. Semgel automatically organizes the data into a clean database ready for exploration and analysis, analyze the data by just clicking around (no need for 'composing queries'). Filtering, drilling, sorting, visualizing, aggregating are all just a click away and share data by publishing data as web pages as well as exporting the data as spreadsheet files. OPENWEB LABS PRIVATE LTD: A Pune-based company which claims to implify the recruiting process with the help of social media. The company has developed a product named Getlive.me, which enables live video and will be able to live broadcast the whole NASSCOM product conclave over the web. The live broadcast will enable group chat about the conference. This does not require any registration to use the product. The company's flagship product Hireplug is used to recruit top talent from social networks through employee referrals or alongside Facebook Ads. Recruiters in over 25 countries use Hireplug to recruit from Social Networks. 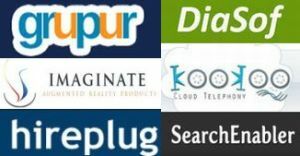 OZONETEL SYSTEMS PVT LTD: Hyderabad-based Ozonetel Systems is offering 'Kookoo' India's first cloud telephony platform for entrepreneurs and businesses who want to develop their own apps which uses telephony channel. The key objective of Kookoo is to address the lack of telephony systems prevailing today, by making telephony functions accessible through a common web platform. Kookoo functions as an interface between the web application and the caller by taking phone commands from one end (caller) and executes on the web. After allowing businesses to build innovative phone applications, KooKoo now provides another channel for businesses to interact with their customers by integrating incoming & out going SMS. NRICH SOFTWARE PVT LTD: The Chennai-based company is focused on healthcare vertical and has developed a product called DiaSof, which offers range of SaaS solutions for chronic therapies. The initial therapy is diabetes where Diasof transforms the interaction between physicians and his patients. Compliance of patients in terms of taking their tests and meeting their doctors in time is very low. This creates a gap in the treatment cycle which is fertile ground for other health complications. DiaSof will access your medical records anywhere, analyse your test result for better treatment, buy the correct medicines anywhere in India, make a difference during medical emergency, share results & charts via email and take your tests on time, every time.